﻿ HuntingNut » Forums » Firearms, Shooting & Reloading » Gun & Firearm Discussions » My new LR toy! Posted: Tue Mar 23, 2010 3:36 pm Post subject: My new LR toy! I FINALLY PICKED ELVIRA UP. I am not much of a LR hunter but love to shoot at LR. Anyway I figured you guys might like her. 375 Cheytac Improved AKA......... 375 Snipetac. Nightforce 5.5-22x50mm Zero Stop scope. Lawton 40 MOA base. good for 2500-3000 yards. For those who do not know what that is, well lets put it this way. It is based on the 505 Gibbs case. 370 Rocky Mountain Hunting bullets 3250fps easy! Posted: Tue Mar 23, 2010 3:55 pm Post subject: Re: My new LR toy! Posted: Tue Mar 23, 2010 3:59 pm Post subject: Re: My new LR toy! WOW, that is a nice setup, would love to get a bit of trigger time with something like that. Would be interested to hear what kind of groups you get at 1000 plus yards. Posted: Tue Mar 23, 2010 4:57 pm Post subject: Re: My new LR toy! You figured right, I like her!!! I've been seeing some info on the Cheytac on the Military channel. Very nice, congrats! Posted: Tue Mar 23, 2010 5:05 pm Post subject: Re: My new LR toy! I only have one manners but I was impressed I have two mcmillans but thought the manners was superior on the inside. Posted: Tue Mar 23, 2010 5:27 pm Post subject: Re: My new LR toy! Very nice POP !!! Congrats on a fine build !!! Posted: Tue Mar 23, 2010 6:05 pm Post subject: Re: My new LR toy! I FINALLY PICKED ELVIRA UP. A rifle that most can only dream about! Really cool!! 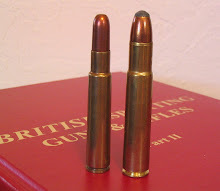 I tried to look up RM Hunting Bullets but couldn't find them on the web. Do you have link we could use? Also, what banded solid is in the right case? Posted: Tue Mar 23, 2010 8:16 pm Post subject: Re: My new LR toy! Posted: Tue Mar 23, 2010 9:43 pm Post subject: Re: My new LR toy! yip very nice. hows does it shoot? Posted: Tue Mar 23, 2010 11:44 pm Post subject: Re: My new LR toy! That is one very sweet "little" lady POP. I'm surprised yer missus is happy to share you with "her". Posted: Wed Mar 24, 2010 3:05 am Post subject: Re: My new LR toy! Posted: Wed Mar 24, 2010 7:03 am Post subject: Re: My new LR toy! Nice set up , I would love to shoot it...what do you have the trigger set at?? Posted: Fri Mar 26, 2010 7:45 am Post subject: Re: My new LR toy! Have not shot her yet. I just recieved the dies but not the press. The dies are like 50 cal so I neede a new press. Here is some more info on the gun/performance bullets etc. The 375 is a necked down and improved version of a 505 Gibbs. Max case capacity for the Cheytac is 161 gr H2O. The snipetac version has more. Specifications for the Cheytac. My snipetac is an improved version! Posted: Fri Mar 26, 2010 3:48 pm Post subject: Re: My new LR toy! Wow that is a sweet rifle. Posted: Fri Mar 26, 2010 7:36 pm Post subject: Re: My new LR toy! A 350 grain bullet @ 3200 FPS has me mesmerized.